CIA Director Leon Panetta told the House Intelligence Committee [on June 24] that the agency had misled and “concealed significant actions from all members of Congress” dating back to 2001 and continuing until late June, according to a letter from seven Democrats on the panel. Continuing until late June? As in, two weeks ago? As in, right up to the time that Panetta testified before the committee? 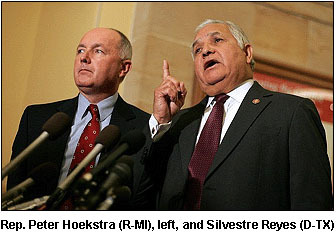 House Intelligence Chairman Silvestre Reyes , D-Texas, this week sent to the panel’s top Republican, Peter Hoekstra of Michigan, a letter saying new information led him to conclude that the CIA has misled and at least once “affirmatively lied to” the committee. Republicans disputed its contents and have said that the Democrats were trying to protect Pelosi. ….Republicans said it was true, as Reyes wrote in his letter, that the classified subject about which the committee was notified was a subject of bipartisan concern. But they did not endorse Reyes’ conclusions that the CIA had lied…. [Hoekstra] said Democrats wanted to help validate Pelosi’s prior claims by establishing other occasions in which the CIA may have misled Congress. Sure, they know better. But what’s that compared to the opportunity to keep a minor partisan squabble alive?